Wow, movie #15 of the Shocktober 2015 season. I had doubts that I would make it this far, to be honest. This weekend will prove to one of the toughest- if I can maintain my momentum through some days filled with traveling and family functions, I might just be successful in my quest to watch 31 movies in the 31 days of October. 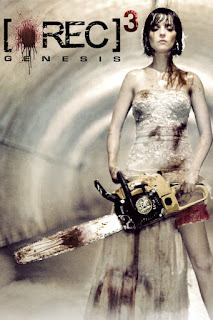 Today's film is [REC] 3: Genesis. I watched the first [REC] a few years ago now, and really loved the zombie-infested apartment building story, particularly for its demonic twist at the end. Yeah, I've given up on hiding that particular spoiler, I mean, you are reading a review of the third installment of a film series. Sorry, I guess? Anyway, the second film followed with a very similar approach; high tension, good gore, and super serious treatment of the material. I really enjoyed [REC] 2, as you can read about in my review from earlier in this Shocktober season. In this, the third installment of the series, the filmmaker take some fairly significant departures from the series' formula. First, they begin with a proper fake out, as the film initially appears to continue in the tradition of the found-footage styles films that came before it. After a late title card though, the film switches to a more traditional third person-style camera. Second, the film is much less serious than the first two films. I found many sequences were played for laughs, there is a significant amount of campiness to all of the proceedings, and the demon-possessed zombies seemed to be much less of a threat. On the one hand, I like horror comedies a whole lot. They might be my favorite genre of film, thanks to that fine line that the best examples of genre walk. On the other hand, I loved the [REC] series as it was, super-serious and deeply foreboding. I wasn't really longing for a comedic turn from these particular films. So, I guess I'm conflicted by the series' new direction in this third film. That said, this is still a well-made film for what it is. The camp on display is cheeky and fun -the imagery of a bride in white wielding a chainsaw to take out hordes of demons is certainly setting off my highly tuned horror silliness detector. Oh right, a bride in white. Maybe I should explain the plot of the film. It's pretty straightforward, the demon-infection from the first two films somehow finds its way to a wedding reception going on at the same time as the events of the first two films. This time line is revealed by some news broadcasts that you occasionally see in the background of this film. The infection at the wedding reception seems to originate with an uncle that claims to have been bit by a dog -how this relates to the events of the first two films, I cannot remember. Was there a demonic dog at one point in those films, perhaps the first film since it has been so long since I've seen it? In any case, I was somewhat confused as to exactly HOW the demonic infection spread from the apartment to this location, but I guess that doesn't really matter. As the reception turns into a living hell, with all of the friends and family dying and turning into zombies, the bride and groom get separated. The film tells the story of them finding one another through these extenuating circumstances and their attempts to survive the demon plague. 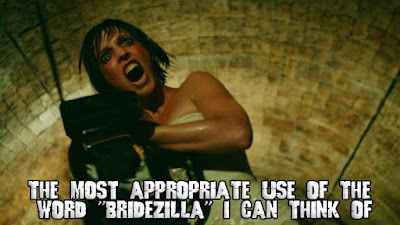 As Mrs. Manson pointed out, you might even be able to consider [REC] 3 a love story. A gruesome love story in which arms are severed and tongues bitten and torn out of people's heads, but a love story nonetheless. 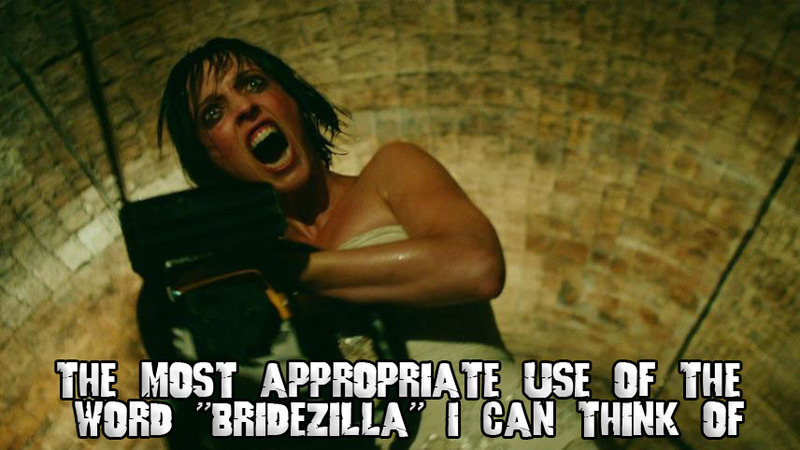 [REC] 3 has some clever moments, and the campy visuals and sequences are decidedly fun. I liked this film; it plays very well. The only caution I offer is that you need to be able to let go of those things that made [REC] and [REC] 2 great. If you can't deal with the loss of the self-serious tone, your will find [REC] 3 to be very difficult to enjoy.